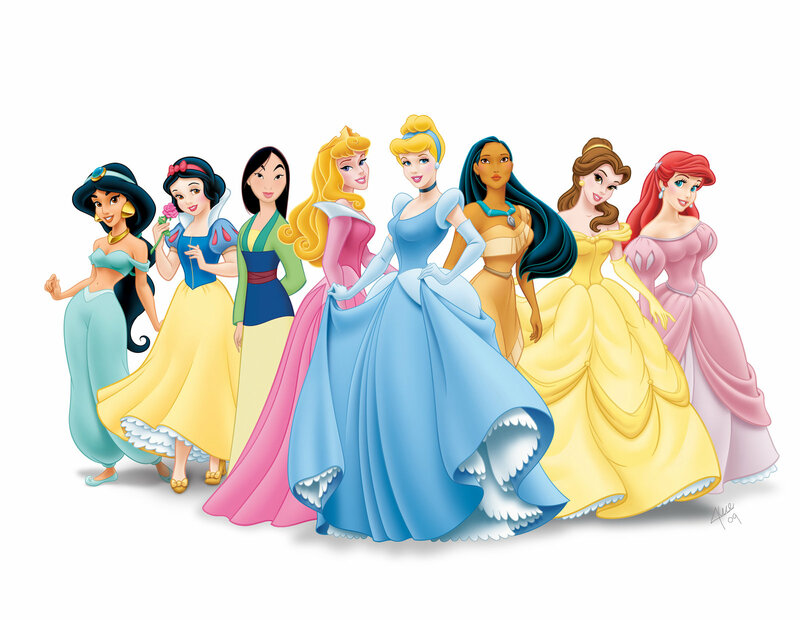 Quick – what do Cinderella, Die Hard, Aladdin, Pirates of the Caribbean: Curse of the Black Pearl, Beauty and the Beast, Star Wars, The Lion King, Batman Begins, Alien, Raiders of the Lost Ark, Toy Story, The Terminator, The Little Mermaid, Rocky, Ice Age and Jurassic Park have objectively in common? Quickly! Faster!! What do they have objectively in common???? You can’t say “They’re awesome” because that’s subjective. And you can’t say “They’re all movies” because that’s just asinine. Okay, time’s up. The correct answer: they all spawned at least two sequels. Those of you who got it right, give yourselves a hand. Those of you who didn’t get it – that’s okay. Not everyone can be a complete movie geek, and thank goodness – then you’d have no reason to read the drivel I write constantly!!! But seriously. Okay, now let’s zero in on the five animated Disney films on that list (I still consider Toy Story to be a Pixar joint); those five films are the only films out of the thirty-seven traditionally animated Disney films that have at least two sequels (there are forty films in the canon, but three of those are sequels, so I am not counting those since it seems weird for sequels to have sequels). Why is that significant? Well, it’s significant because there was a time when DisneyToon Studios (a Disney subsidiary) was cranking out direct-to-video sequels like it was going out of style, and from 1990 to 2008, DisneyToon Studios and Disney Animation Studios made at least one sequel for twenty-two different Disney movies. But, there’s a second sequel for only those five. If you do the math, 59.5% of Disney’s animated movies received a sequel, but only 13.5% received a second sequel. That’s a significant difference. So, let’s look at those five movies. Cinderella, The Little Mermaid, Beauty and the Beast, Aladdin and The Lion King – of those five films, which one doesn’t fit? It would be Cinderella, right? I mean, the other four were released in a very small window (1989-1994), and they all served an important role in establishing what everyone calls the Disney Renaissance. They are the modern Disney All-Stars. It stands to reason that Disney would make two sequels for those films – they were and still are juggernauts. And Cinderella is in their company?? Does that mean Cinderella is an All-Star? Though it was released in a completely different era than the others (1950), can it also be called a juggernaut? You wanna know my answer? YES. 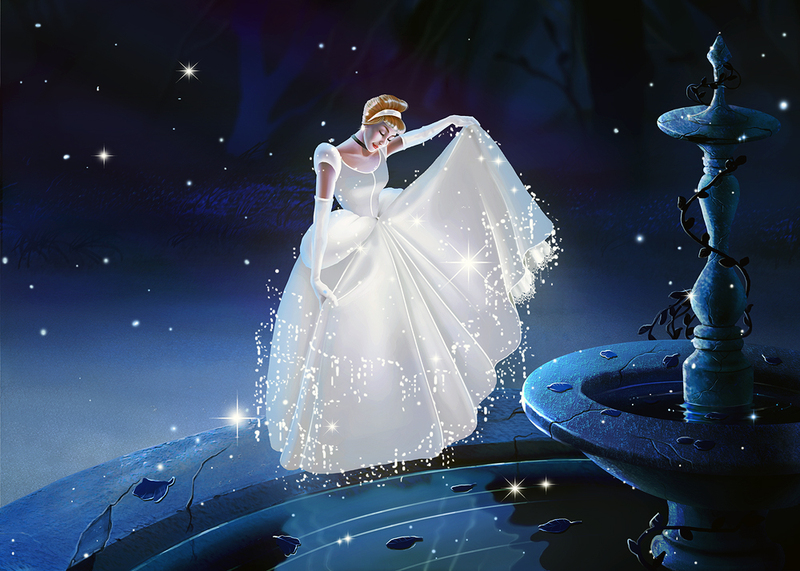 Cinderella is easily a Disney Animated All-Star. Cinderella is easily a juggernaut. It earned those two sequels. It’s not like they were made out of charitable feelings. No, Disney made them because they knew people would eat them up! Because people ate up the the original!!! Because the original is easily one of the best movies Disney ever made!!!!!! Cinderella’s in the middle, so she’s the best. Now that we’ve established Cinderella as being one of the best Disney movies ever, you might be thinking the following questions: “Soooo…….should I watch it?” “It doesn’t offer anything for grownups, does it?” “What makes it so good?” The answers: yes, you should watch it, it definitely has stuff for grownups, and it is good because of the great characters, music, and story. I give it an 8.7/10 and highly recommend it. The thing that stands out most to me about Cinderella is the slew of great characters. Cinderella, Lady Tremaine (evil step-mother), Gus Gus, Jaq, Prince Charming, Fairy Godmother, Lucifer, The King, The Grand Duke – that’s quite a lineup. That’s a culturally-significant lineup. I mean, how many girls want their “Prince Charming”? And how many times have people wished they had a “Fairy Godmother”? That all started with this, right? Anyway, the characters are really well-written; they each fill their roles quite well. Having said that, the three stand-outs are Cinderella, Lady Tremaine, and Gus Gus. I believe Cinderella might be one of the most well-written Disney characters ever. She is very real and very believable. I like how she seems well-aware of the hatred her “family” feels for her. And I like how she’s just a little sarcastic sometimes; she doesn’t appreciate the way she’s treated, so she mouths off. It seems like a realistic reaction, and it makes me like her. I also like how she gets super excited about the ball, like she isn’t totally cynical yet. That makes her admirable, if an animated character can be admirable. The last thing I really like about Cinderella is that she has no idea that it’s the Prince she meets at the ball. She is so flustered by everything leading up to that point that she forgets what she’s even there for. That seems quite likely, and it serves to make her even more endearing. So, if you’re keeping score, Cinderella is a realistic, aware, likable, admirable, and endearing character. She’s awesome. The magic runs out at midnight…or as soon as she falls in that fountain. Art by Valeria Hoon. On the flip side, Lady Tremaine is easily one of the most evil persons of all these films. She isn’t an over-the-top witch, sorceress, Horned King or anything like that; instead, she is just hideously mean. She has a way of being perfectly awful to Cinderella that makes me shudder. It’s like she takes pleasure in demeaning the poor girl. And she doesn’t raise her voice or go into wild rages – she stays very proper, almost like it’s a game for her to see how cruel she can be while maintaining a steady countenance. It’s grotesque. What’s worse, it’s believable. The typical Disney villain is a caricature of evil, usually someone with grand designs on taking over the world. Or taking over puppies. But really, how many people have there been in the world that could be a typical Disney villain? One? I mean, I can’t think of anyone other than Hitler. The point is, for every Hitler, there’s dozens of people who take pleasure in being cruel to the less-fortunate. Lady Tremaine is all those people wrapped up into one shudder-inducing character. Blechhhhhhhhhh. and then watch the movie to get a full appreciation for dear Gus Gus. 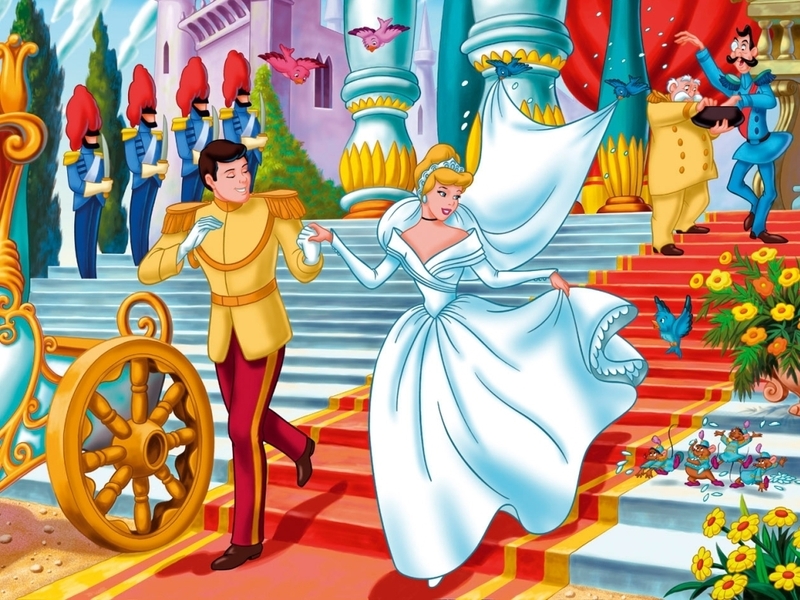 Overall, Cinderella has a remarkably effective ensemble of characters that lifts it high above the typical animated film. Cinderella‘s soundtrack is as good as any Disney soundtrack ever. It has some of the most iconic songs ever written including “A Dream Is a Wish Your Heart Makes”, ‘The Work Song” and “Bibbidi-Bobbidi-Boo”. I promise that nearly any person who’s grown up in America would recognize those songs, and that just re-affirms the film’s cultural significance. 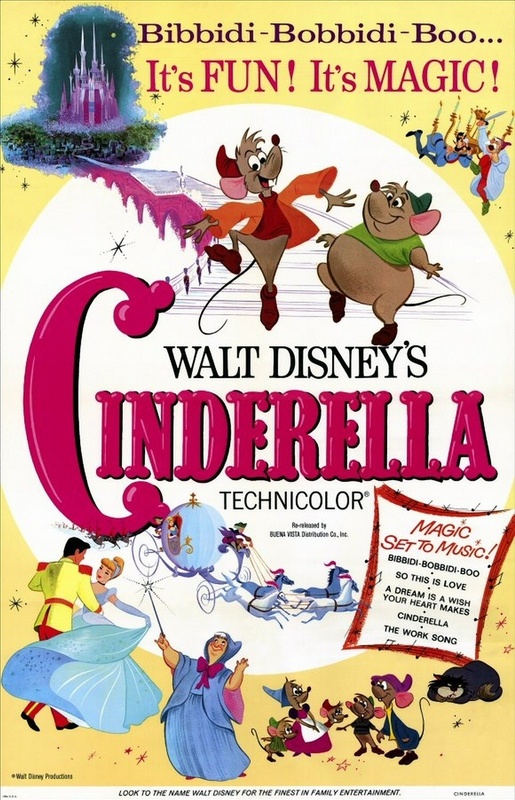 Also good are “Cinderella” and “So This is Love”, the film’s title song and love song, respectively. Wow, I thought there would be more to say about the music, but really, I guess all you need to know is that it’s very done. Just another reason to watch the movie asap. The last thing I want to touch on is Cinderella‘s story. Based on Charles Perrault’s “Cendrillon”, this tale of a girl stuck in unfortunate circumstances and then rising to unbelievable heights has captured the hearts and imaginations of people around the world. 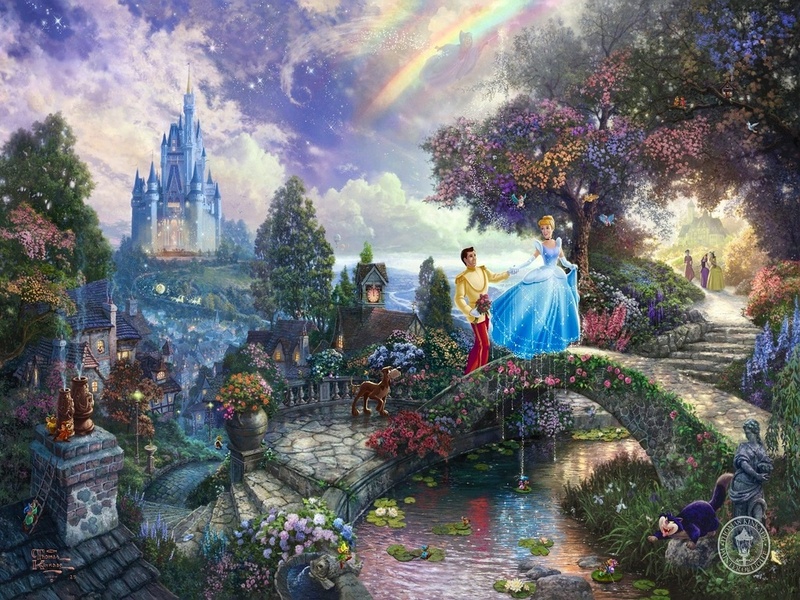 Its message of hope has inspired books, movies, songs, and countless other endeavors (proving again Cinderella‘s cultural significance), and it makes sense, for what is more powerful and inspiring than hope? Fear? No, I would say hope trumps fear. Hope strengthens while fear weakens. Hope brightens while fear darkens. Hope gives while fear steals. We all want and need hope. And the hope in Cinderella isn’t a selfish, consumer-driven hope; it’s a wholesome optimistic hope that believes that good behavior and character will not go unnoticed, and that, with help from above, we can triumph over literally any kind of oppression. That is really deep, but for serious, the story is just that good. In closing, Cinderella is a great movie. It has great characters, lovely songs, and a powerful story. To me, it’s no wonder Disney saw fit to release two sequels – when you have such a goldmine, it only makes since to see how far the vein runs. Only the deepest, richest goldmines go far, and Cinderella is certainly one of the deepest and richest. 8.7/10. Cinderella is a goldmine of cinematic goodness. So………after unleashing upward of 1500 words on Cinderella, I’m wondering if I can get even 500 on Atlantis: The Lost Empire. Let’s give it a try. 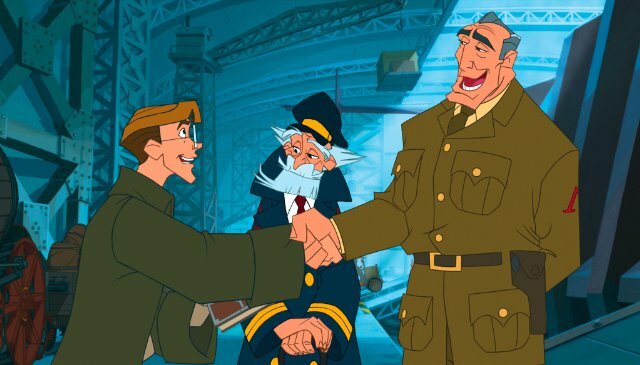 In Atlantis: The Lost Empire, Disney forgot to dot all their i’s and cross all their t’s…and their a’s. You’ve all heard of Plato, right? One of the founding fathers of Western philosophy, great thinker, blah blah blah? Well Plato was doing his groove thang back in the BC, from like 428-348, and at some point he decided to write some dialogues or whatever. One dialogue was called “Timaeus”, and it contains the first literary mention of a lost island called Atlantis. However, in “Timaeus”, Plato leaves that subject fairly quickly since he’s more interested in talking about garbage like the Nature of the Physical World, the Purpose of the Universe, and the Creation of the World Soul. Like anyone cares about that. He later got bored with his bad self and decided to write another dialogue. He called this one “Critias”, and it really delivers, ’cause it tells the story of the mighty oceanic kingdom of Atlantis. According to “Critias”, Atlantis was situated on a GIANT island in the middle of the Atlantic Ocean. The people who lived there were chill and liked to keep it real until one day, they got all wack and decided to attack Athens. Bad idea. Since Athens was like mega-awesome, they knocked the Atlanteans upside the head and then the island sank into the ocean “in a single day and night of misfortune”. Ugh, hate it when that happens. If Indy can’t find it, no one can. Through the ages, people have debated a lot over whether Atlantis was real or not. The entire story is based on Plato’s dialogues, and nobody is sure if Plato meant for anyone to actually take his account seriously. Well, regardless, people have become uber-obsessed with finding the island. People have written reams on Atlantis, and researchers have not entirely given up the possibility of a real Atlantis. 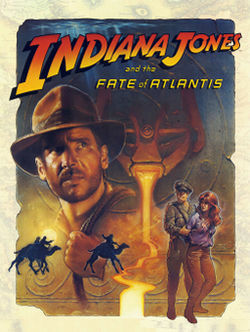 One company, LucasArts, made a video game called “Indiana Jones and the Fate of Atlantis” to help figure things out, and in 2001, Disney decided to help out the effort with their rollicking movie, Atlantis: The Lost Empire. Based on a Hollywood screenplay, ATLE tells about how a nerdy guy named Milo is related to some guy who had a book about Atlantis that no one else knew about except for an eccentric guy named Preston Whitmore. Lucky for Milo, Whitmore is an eccentric millionaire. It would’ve made for a lame story if the only person who knew of the book was Gary the hobo. Like, the whole movie is Milo train-hopping with Gary, making Mulligan stew, looking for fresh socks and wearing everyone out about Atlantis. Actually, that might’ve been better. 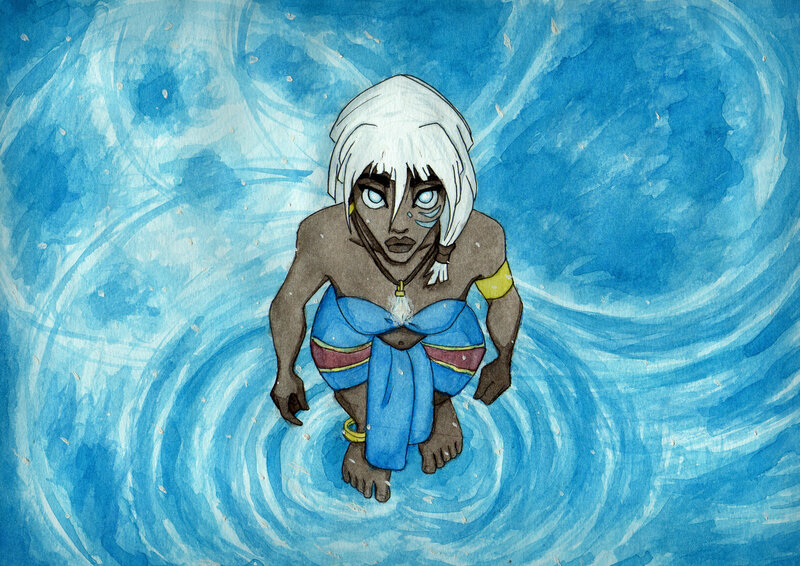 Kida is about to become pure energy. Or something. Anyway, Whitmore has unlimited resources, so he is able to build a whale-of-a-ship that is far more advanced than anything James Cameron ever dreamed of in The Abyss. And since Milo is the foremost expert on Atlantis, he is invited to come on an expedition to find it once and for all. Adventure ensues, they find Atlantis, Leonard Nimoy is the Atlantean king, some bad guy has to muck it up, lots of people get killed, and crazy Atlantean power unleashes these humongous statue things from under the ocean to do something important. I don’t really remember. 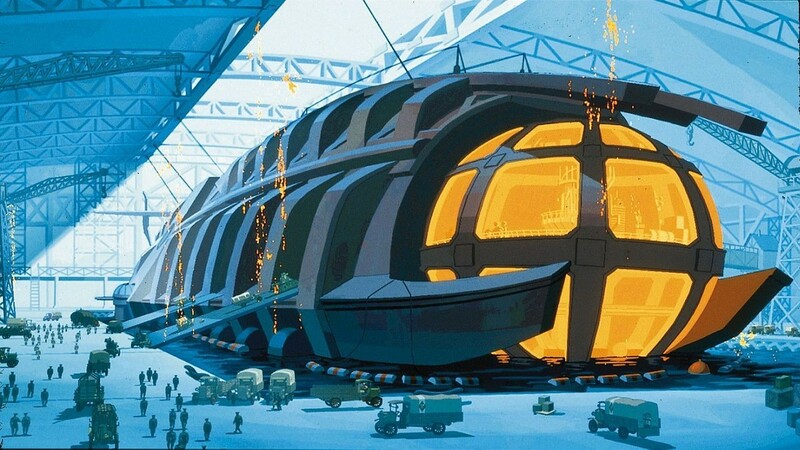 James Cameron needs this ship. Honestly, Atlantis: The Lost Empire begs the question: why? As in, why did Disney make this motion picture. Like, I give them credit for trying something adventurous and non-fairytale-ish, but really, it’s not a great movie. There’s problems with the plot, dialogue, and pacing, and while I like the concept of the whole thing (I’m all about Atlantis stories if they’re done well), I feel like the story lacks any kind of emotional punch. Walt Disney famously said that for every laugh there needs to be a tear; in Atlantis: The Lost Empire, the only tears I had were from boredom. Voice actors – this thing boasts an impressive voice acting cast. Michael J. Fox (!!! ), James Garner (!!! ), Leonard Nimoy (!!! ), Jim Varney (!!!) and lots of no-names. Actually, some of you might recognize Claudia Christian from Babylon 5 fame; I sure didn’t since I never watched that show. Regardless, I love those first four guys, and it was interesting hearing all their voices together. Animation – the animation in this thing is suuuuuper smooth. It has more CGI than any previous Disney animated movie, so the backgrounds are gorgeously detailed, and the CAPS process gives it a full, clean coloring as usual. The visuals are the best thing about this movie. Michael J. Fox shakes hands with James Garner while Gary the hobo looks on. 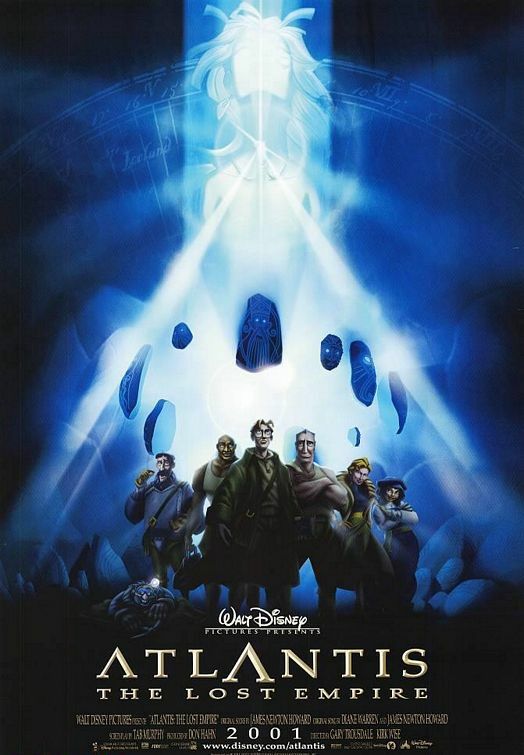 Overall, Atlantis: The Lost Empire is a somewhat boring film that hints at some good ideas without ever fully realizing them. It has very pretty visuals and animation, and the voice-acting talent is superb. Unfortunately, that’s not enough to keep the film from being the motion picture equivalent of “a single day and night of misfortune”. 5.9/10. Grant Stevens is a freelance writer who enjoys watching movies, playing basketball, and playing music. He is also the founder of the Use Ironic Correctly Society, and he is interested in apologetics with William Lane Craig. Check out his music at www.grantstevensgroup.com as well as www.soundcloud.com/grant-stevens-amazing.